Your outdoor kitchen will add the most value if it complements a comfortable outdoor living space or pool. The outdoor kitchen shouldn’t be just a place to prepare food, but rather a social area. Plan seating, shade, even music and tv to accompany the cooking area. 2. Pick materials that will last. A quality grill, polymer cabinetry, good stone work, and the right countertop will stand the test of time. Wood, non-stainless metals, and poor craftsmanship will turn your investment into a maintenance headache and eyesore in no time. As with any home feature, if it is falling apart it will cost you money to bring it up to good condition before selling your house. It is better to pick the best quality product in the beginning. 3. Don’t fall for pretty pictures alone. Pretty pictures of brand new installations don’t prove that a product belongs outdoors. Look at the brochures you are being shown with a critical eye. Does the area look nice because there are a bunch of decorations including pillows, curtains, or other items that won’t last outside? A popular home improvement store recently featured a do-it-yourself island that consisted of painted pine lumber, a tile top on plywood, with tons of decorative accents like fabric covered storage bins. That looks great for the photo shoot, but won’t last outside. 4. Be reasonable with your appliance selection. Grills for outdoor kitchens can range from a few hundred dollars to even ten thousand dollars. Don’t get carried away with the grill if you expect the outdoor kitchen to add lasting value to your home. Pick a grill with a high quality stainless steel interior, but you can skip some of the over-the-top bells and whistles. 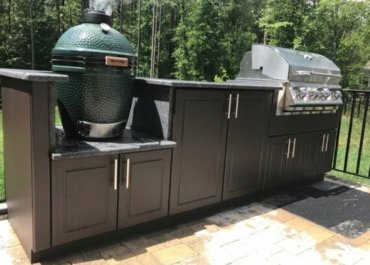 Versatile appliances like kamado style cookers (think Big Green Egg) can do the job of a pizza oven, smoker, charcoal grill, and more. Buying individual appliances that serve just one purpose can waste money and valuable space. 5. Keep an eye on quality for items that can’t be changed easily. Identify appliances that can be replaced easily if they fail. An under counter refrigerator can be replaced easily. That might be a smart appliance to save money on. However, a grill that has granite and a supporting structure cut to fit that exact model of grill can’t be changed easily. Does a lifetime warranty from a startup company mean anything? Have their products been tested with a proven track record of success? Several outdoor kitchen and grill companies offering lifetime warranties have gone out of business entirely recently. That doesn’t mean there aren’t some really great new ideas in outdoor kitchens, but be cautious believing the promises of startup companies. 7. Keep up with the Joneses. Don’t worry, this tip isn’t as obnoxious as it seems. It might be better stated “Don’t try to out-do the Joneses”. As with any home improvement project, you have to keep your projects in reasonable line with your neighborhood if you plan to see the value of your investment. If you add a $100,000 outdoor kitchen to a $200,000 house, you will never see that value again. However, if you add a $20,000 outdoor kitchen to a $250,000 house, you’ll most likely retain that outdoor kitchen value, or at worst your house will sell before your neighbors, saving you potentially thousands in carrying costs if you every plan to move.